Just when it looked bleakest for fans of old school orchestral scores, this summer delivered two knockout soundtracks. Michael Giacchino’s vibrant music for the epic movie masterpiece “Dawn of the Planet of the Apes” packs an emotional wallop, while Alexandre Desplat’s wickedly fierce strains for “Godzilla” contain some of the most exciting action cues heard on any soundtrack in years. Desplat’s immense talent and command of orchestra have been well documented in the film music community. Given his impressive and varied output, he is arguably the best composer of the past decade, certainly in the top five. But never has his music been this focused and this riveting. This is a sinister, delightful, over-the-top, relentless soundtrack that grabs you, shakes you, and never relents. Now keep in mind, this is not a varied soundtrack with a lot of thematic material and melody. It does one thing and it does it well. Boy, does it ever. This is an action score, literally almost from start to finish. 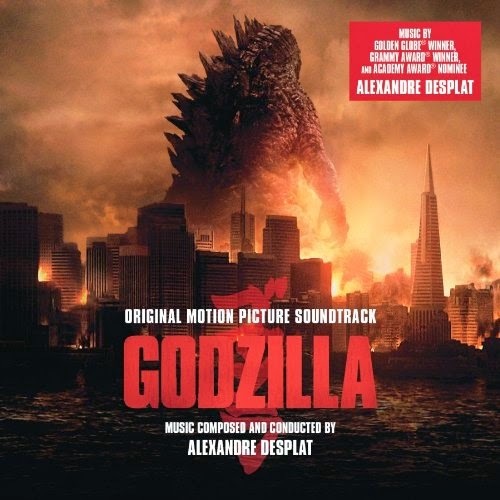 Desplat wastes no time unleashing his orchestral might with the main theme in track one, “Godzilla”. This is an insanely exciting piece of music that escalates in compositional layers beginning with a brooding quasi-heroic motif reminiscent of Elliot Goldenthal’s anthem for “Batman Forever” and Jerry Goldsmith’s theme for “The Shadow”. From there the theme explodes into a Herrmann-esque frenzy with battling brass, stabbing strings, and finally a whaling siren/roar to represent the legendary beast. The fun continues with colorful, spooky suspense in “Inside the Mines” and “The Power Plant”, a cue that introduces the score’s emotional and dramatic material. Most of the middle tracks have moments where this dramatic theme re-emerges, but never for long before we are whipped back into the orchestral thrill ride of pulsating brass and furious perfusion. This is a score that attacks. “Inside the Jungle” is the most exciting primal action music since John William’s “The Lost World”. There are times when it sounds like two competing orchestras are doing a battle of the bands, literally. Talk about a composer being in command of the orchestra. “Two Against One” is an absolute joy of thunderous delight, “Last Shot” a roaring fury, and “Godzilla’s Victory” brings the aggressive mayhem to rousing finale before some reflection and a restatement in “Back to the Ocean”. Bottom line: “Godzilla” contains the most exciting and energetic action music since Alan Silvetri’s “The Mummy Returns”. This impeccably crafted score is a blast. It is an addictive listen and a must own for fans of action and suspense music.